The ongoing feud between the Baltimore Orioles and Boston Red Sox took an unintentional turn Wednesday night, one that was most detrimental to the Orioles. Baltimore starter Kevin Gausman was ejected in the 2nd inning after hitting Red Sox shortstop Xander Bogaerts with a 76 mph curveball. The hit-by-pitch was unintentional, but considering the tension between the teams, home plate umpire Sam Holbrook immediately ejected Gausman from the game. With Gausman out of the game early, the Orioles were forced to use long man Richard Bleier and Thursday’s scheduled starter Ubaldo Jimenez to get through the rest of the game, which will force them to re-arrange their starting rotation prior to Thursday’s series finale with the Red Sox. Baltimore went on to lose Wednesday’s contest 4-2. Part of the reason why Holbrook was so quick to eject Gausman is that MLB Commissioner Rob Manfred intervened in the ongoing feud between the two teams earlier in the day. Manfred spoke with both the manager and GM of each time prior to Wednesday’s game in an effort to squash the issues between the two teams after Manny Machado had a fastball thrown behind him by Chris Sale Tuesday night. It was the second time in a little more than a week Machado was thrown at by a Boston pitcher. “I guess the best way to describe it is to confirm there was a call that happened with both clubs to basically address the last two weeks and to say ‘enough is enough,'” explains Red Sox manager John Farrell. Farrell confirmed that Manfred did not give either team an official warning about what would happen if more batters were thrown at. However, Holbrook told reporters that prior to the game, Manfred put the umpires on “high alert for anything,” which prompted a quick ejection of Gausman on a curveball that got away from a pitcher who currently has a 7.55 ERA. Of course, the pitch didn’t hit Bogaerts in the back, as the ball dropped harmlessly onto the upper part of his leg. The immediate reaction of Gausman and Baltimore catcher Caleb Joseph made it clear that the pitch was not intended to hit the batter, as a 76 mph curveball is hardly retribution for two fastballs that have whizzed past Machado in the past 10 days, including one thrown at head level. 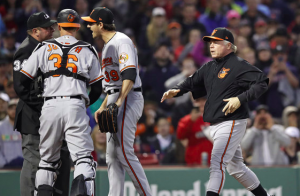 If the Orioles wanted to do anything in response to Machado being thrown at twice, they’ve all but lost their opportunity to do so, knowing that any pitcher who throws anywhere close to a Red Sox batter will be immediately ejected. The two teams complete their series Thursday night and won’t meet again until early June. Baltimore’s losses the last two nights has taken them out of first place in the AL East, and following the shenanigans with Gausman’s ejection Wednesday, the Orioles just want to get out of town as soon as possible.